Vint Cerf is considered one of the "founding fathers of the Internet. He is also Vice President & Chief Internet Evangelist of Google. In this video, he justifiably evangelizes about the Growing Connection and the EarthBox sub-irrigation planter. We desperately need other leaders from the fields of technology and science to speak out about modern methods of urban agriculture. The causes of better science education and local food production would be well served if more professionals from outside the fields of gardening and horticulture would join the conversation. While our USDA extension program, the National Gardening Association and others in the media drone on about “you’ve got to have a drain hole” nonsense, we’re fortunate to have two leaders like Dr. H. Marc Cathey and Vint Cerf. They are advisory board co-chairs of The Growing Connection, a U.N. agency, which is a major supporter of sub-irrigated planters through its connection to the EarthBox. Dr. Cathey is President Emeritus of the American Horticultural Society. I’ve known of him since my first days in the interior plantscaping industry back in the mid ‘70s. As a speaker at our trade shows, he was a big help to all of us groping our way along in a new industry. Vint Cert, known as a “founding father” of the Internet is Vice President & Chief Internet Evangelist of Google. Of course, we all know about Google, a major success story in the history of U.S. business. I would not know what I know about our out of date horticultural education without Google web and individual site searches. Both good and bad information have no hiding places from Google. It is perfectly understandable why they would be supporters of the EarthBox as a company. It is the only high profile name brand in the field of sub-irrigated food planters. Recognize however that although the EarthBox is a patented product, no one can patent the benefits of sub-irrigated planters. Sub-irrigation, along with its benefits, is in the public domain. Whether you plant in a repurposed pop/soda bottle, an EarthBox, or any of the inappropriately named “self-watering” planters the core principal is the same. Whether you are growing tomatoes, or houseplants the core principal is the same. Water moves up from a reservoir into the soil via some form of wick by the basic principal of physics called capillary action. It is just that simple. As the EarthBox has proven, vegetable production is dramatically increased with water savings in the range of eighty percent. These benefits attracted The Growing Connection in its work with third world countries with scarcities of rich soil and water. It is also the ideal approach to urban agriculture where open land and space are at a premium. If two distinguished professionals like Dr. Cathey and Vint Cerf can see the benefits, why is that so much of our horticultural bureaucracy cannot. Why are they still playing with clay? This is a photo from a slideshow marking the one-year anniversary of the organic EarthBox Garden at Google. It continues to be a puzzle that Google gets it but most of our gardening institutions do not. Maybe they haven't learned how to Google yet. If they did, they would know about the EarthBox along with the Tomato Success Kit, the Garden Patch Grow Box and many other homemade sub-irrigated planters. 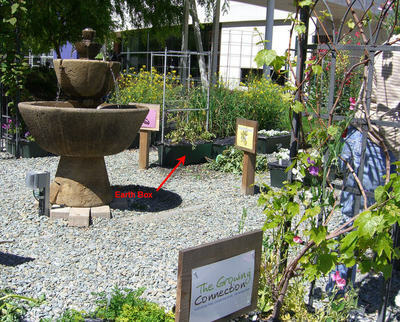 This is the EarthBox garden at Google headquarters in Santa Clara, CA. Read an interview with Rebecca Jepsen, Google’s Manager of Culinary Horticulture. Watch a video about Google and The Growing Connection. TTMYGG: Why is the Earth Box interesting? Rebecca: The Growing Connection used EarthBoxes in 3rd world countries where the soil is not viable to grow the produce necessary to end hunger, disease, or provide proper nourishment. Bronx, fire escapes in San Francisco, or on balconies or patios around the world.